First choices will be crossed out as the mods see the requests come in. If two people request the same one before the mods have a chance to cross it out, the second person will get their second request. In the remote possibility that both your choices are already chosen, we will contact you to make a third choice. Once all stories are claimed, you will be e-mailed with the name of the person you are writing for. You may then check your recipient's own stories and so forth to get an idea of what she likes. Do not contact your recipient however, as authors will be revealed when the stories are revealed. Please do not wait too long to choose the requests you wish to claim! You can refresh your memory of the rules and deadlines HERE. 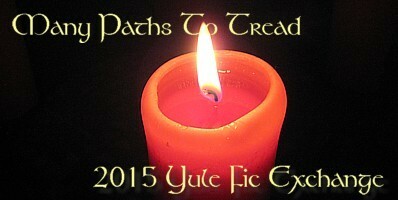 Yule Fic Exchange Requests 2015. 2. Elladan and Elrohir in the wildderness. They can be fighting or tracking Orcs, or maybe just traveling to far lands. 3. I would like a story with Gandalf celebrating Yule/Midwinter/whatever for the first time - either his first time with a certain people, or his first time at all. It doesn't matter who he's with - Elves, Men, Dwarves, Hobbits, even other Ainur - or which of his many names he's using, though I'd prefer the name be accurate to the people he's staying with, unless there's reason for it not to be. He could even be telling the story in flashback to someone else. It's up to you. 4. I'd love a fic about a Yule with Bilbo, maybe his first one after he returns from his Adventure, or a year or two later. Book-verse, please. 5. Idril, Aredhel and Meleth solve a winter-themed mystery in Gondolin. 6. Something about Christmas or Yule celebrations in either the Shire, Gondor, or Rohan. 7. Any Fellowship members celebrating Yule or having a wintry adventure. 8. I would like a story featuring either Boromir or Faramir as he searches for the perfect gift for his brother. The event can be any occasion -- birthday, Yule, a special honoring event, or just because brothers give each other gifts from time to time. 9. I'm insatiable when it comes to Cormallen fic for any character(s); fics about what life in the West might be like for Sam, Frodo, Bilbo, and/or Gimli, or the Elves’ perceptions of them; Third Age hobbit tales that are fluffy and loving (gentle hurt/comfortcomfortcomfort is always appreciated); and tales about Big Folks interacting with hobbits. Extra hugs for good food, good cheer, and a happy ending. 10. I would love a gift involving the family 'Ur (Bombur, Bofur and Bifur) from the Hobbit. Maybe how Bifur took care of Bombur and Bofur growing up. Or the aftermath of Bifur's injury. Daily struggles (and joys) the family 'Ur go through as your average dwarves. BONUSES: Any Aus, hurt/comfort, angst, humor, dark. DON'S: Genderbending, 1st person pov, 2nd person pov, character hopping, crack. Thanks! 11. An Avar navigates through darkness and bitter winter storms, among other dangers, to find and rescue their missing sibling. 12. Maglor in Imladris. Scenes with Elrond and his family would be nice. Endless love if Aragorn is included. 13. I would like a story about Idril, during any time period. Drama and/or politics would be an added bonus! 14. Gandalf finds himself spending Yule in the Great Smials as Gerontius's guest, and is ambushed by a number of the Old Took's grandchildren demanding stories and other entertainment. 15. I’d love something where Maglor overwinters in Imladris by Elrond’s invitation. Involving the Solstice would be welcome but is not required. Bonus points for emotional hurt/comfort. 16. Gondor, a look at a month in Boromir's life. Secrets and lies, a forbidden relationship, trying to be the person his father expects him to be? Slash would be welcome but not essential. A winter setting would be great. 17. I would like a sweet fluffy story about Maglor and Elrond at any point in their lives. 18. I would love to read something set in the First or Second Age with friendship between Elves and Dwarves, with members of the different groups learning something from each other (it could be languages, smithcraft, their traditions and stories, or something else). 19. I'd like a Celebrimbor story set in Second Age or afterwards. Friendship with Dwarves, relations (good or bad) with other Elves of note, Annatar/Sauron, Halls of Mandos, divergent AU/time-travel in which he or his spirit get to meet someone from Third Age, reembodiment - anything goes. Something shippy (of any sort) and original characters are okay, but I'd prefer it if the fic wasn't 100% romance and please no non-canonical side ships.